More than four decades after her death, Billie Holiday remains one of the most gifted artists of our time–and also one of the most elusive. Because of who she was and how she chose to live her life, Lady Day has been the subject of both intense adoration and wildly distorted legends. Now at last, Farah Jasmine Griffin, a writer of intellectual authority and superb literary gifts, liberates Billie Holiday from the mythology that has obscured both her life and her art. 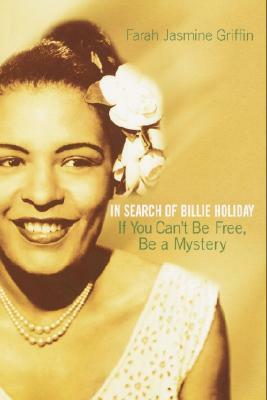 An intimate meditation on Holiday’s place in American culture and history, If You Can’t Be Free, Be A Mystery reveals Lady Day in all her complexity, humor and pain–a true jazz virtuoso whose passion and originality made every song she sang hers forever. Celebrated by poets, revered by recording artists from Frank Sinatra to Macy Gray, Billie Holiday is more popular and influential today than ever before. Now, thanks to this marvelous book, Holiday’s many fans can finally understand the singer and the woman they love. A Billie Holiday fan for as long as she can remember, Farah Jasmine Griffin is currently a visiting professor at Columbia University. She is the author of “Who Set You Flowin’?”: The African American Migration Narrative.